This is the kitchen tool you’ve been waiting for. 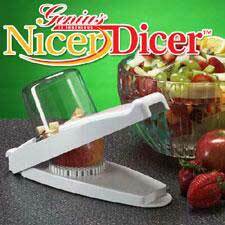 The amazing Nicer Dicer will make your life easier, safer and more fun in the kitchen. Dice, chop or julienne fruit, vegetables, cheese fresh herbs and a whole lot more in minutes (even seconds)! You’ll be amazed at how perfectly you can dice a fresh tomato for salsa or omelets. Put down that knife and give your eyes a rest when chopping fresh onions. All of the chopped ingredients transfer instantly from the cutting surface into the polycarbonate bowl. There’s no need to make a mess of your counter-top anymore. The Genius Nicer Dicer is perfect for cutting onions, zucchini, peppers, celery, pickles, tomatoes, hard boiled eggs, herbs, cheese and even your favorite fruits such as apples and pears. The Nicer Dicer is designed with precision German engineering and built with high-impact molded plastic, polycarbonate, stainless steel cutting blades and is dishwasher safe.